Marissa Oosterlee (1981) is a Dutch artist and illustrator. Her late granduncle was the established American illustrator and pin-up artist Leo Jansen. 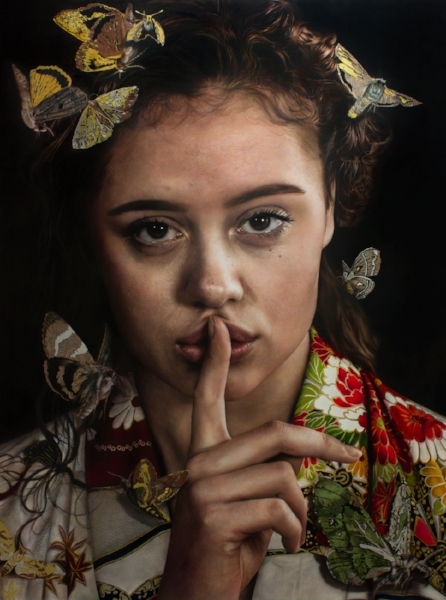 Over the following years, Marissa acquired worldwide attention with her photorealistic paintings. In these works Marissa creates her own reality, convincingly realized with photorealistic painting techniques. Her love for nature can be recognized in her magical realistic works, sensitively depicting the world of fairies, elves and forest animals. She has been awarded several times for her work. In 2004, she won a national Dutch painting competition with her portrait of the Queen of Holland. Also, she was finalist in a prestigious painting competition organized by Artist’s Magazine for her work ‘Left Behind’ (2007). Q&A’s and works by her have been published by several newspapers, tv programmes, international magazines like Airbrush Art and Action, Airbrush Step By Step, and Art Scene International. Marissa gives demonstrations at airbrush and art shows throughout Europe and the UK. Nowadays she remains in The Netherlands, running her own gallery and studio (Foxy Studio), where she works and gives workshops together with Carlo Tedesco, who is also known for his band Phonorama and their album “Retrology”.